When I first learned that chicory grew wild in southern Ontario, foraging for it and roasting the root of this coffee alternative was in the back of my mind as a fun thing to try. Last weekend—with the ground moistened from recent rains, some spare time in the countryside, purple flowers sighted in the fields, and a few youtube tutorials under my belt—I finally got around to giving it a go. And, although quite labor intensive, the resulting bitter home brew was much more complex, sweet, and delicious than I had anticipated! Roasted chicory root is an infamous, inexpensive, and caffeine-free coffee substitute. Sometimes it’s mixed into pre-ground coffee as cheap filler (folks who grind their coffee at home shall not be duped!). Throughout history, non-coffee growing populations have turned to chicory when coffee is scant— during economic downturns such as the Great Depression, or as a reaction to a morally imposed coffee ban. Many of us only recently learned from Blue Bottle Coffee that chicory can also be added to roasted arabica as a welcome flavoring. When mixed with milk and sugar, the resulting decadent, French-inspired, coffee and chicory beverage is called New Orleans Style Coffee. Of course, I am interested in chicory because of its relationship to coffee, but I am also intrigued by the notion of a bitter brew that wont leave me with the jitters. Since sleep has been elusive for me this year (and not being able to sleep is the worst! ), I have started to seek out more low-to-no caffeine coffee alternatives. The best part about chicory is that I can harvest, roast, and experiment with brewing it myself. If you live in North America or Europe where this plant grows, perhaps you can, too! 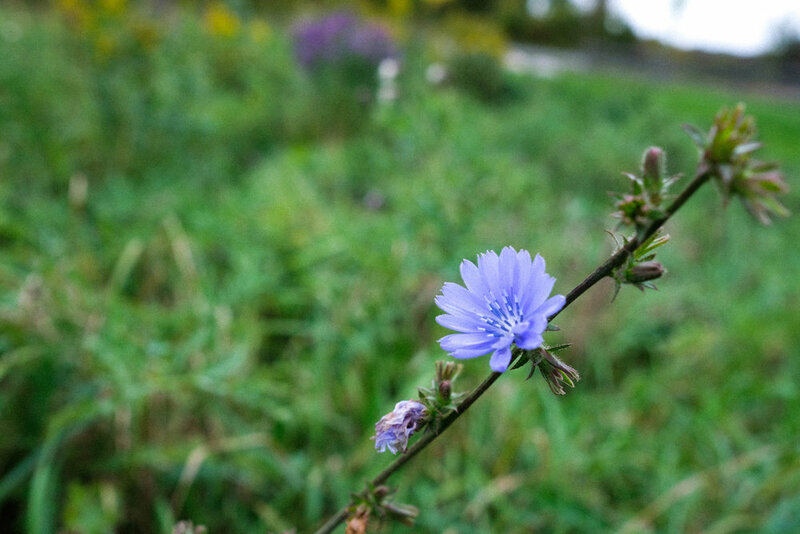 Chicory is pretty easy to spot on the side of the road or in a field with its spindly stalks and purple-ish blue flowers. As chicory is a relative of dandelion, you will notice leaves at the bottom of the plant which look a lot like dandelion leaves. According to some websites, the leaves and flowers are also edible and go well in salads. I didn’t try this and, disclaimer: without further research don’t recommend that you do either. 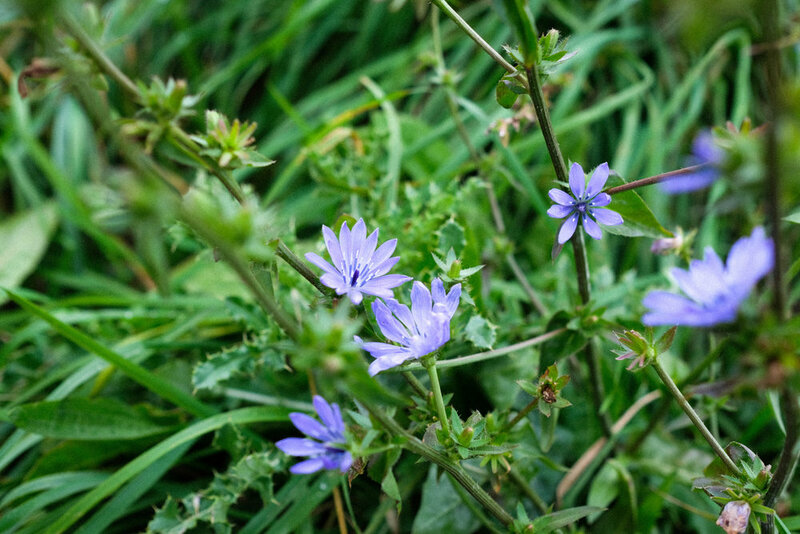 Either way, it’s best to source chicory that grows organically or in a low traffic and pesticide-free area. Much like a carrot, chicory has a taproot. 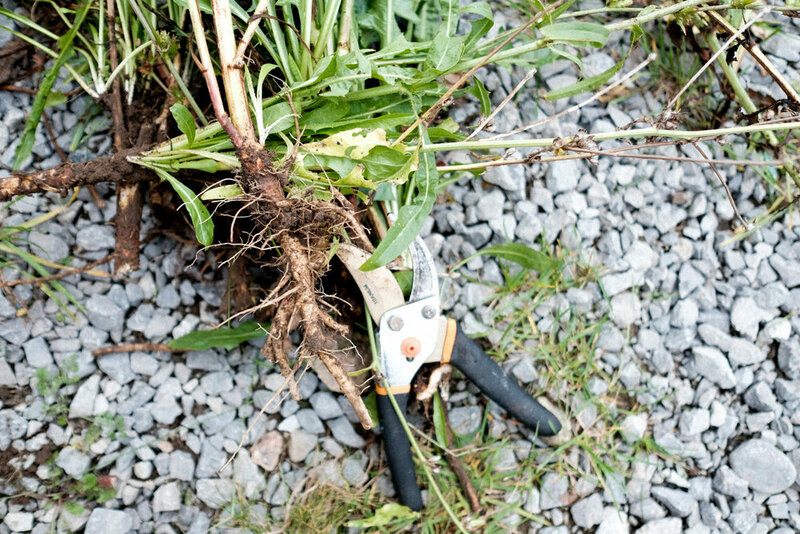 To harvest it you have to get a shovel relatively deep underneath the long root as not to break it. 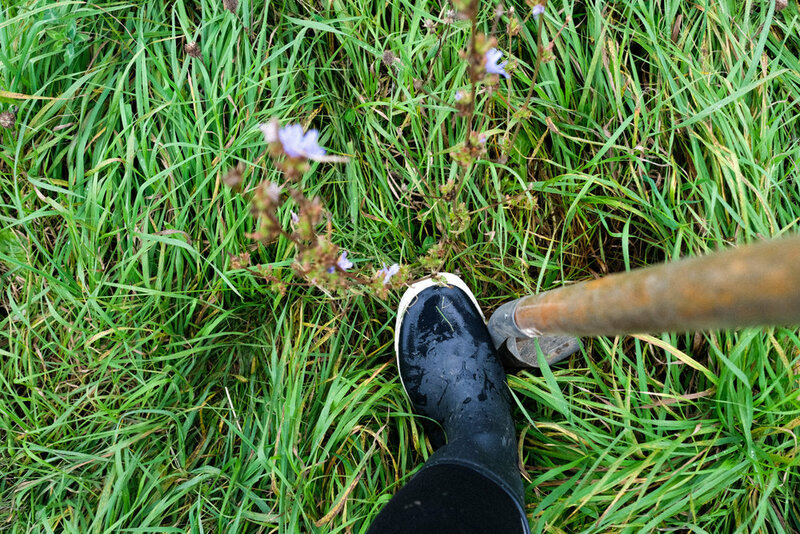 As I mentioned before, chicory is most easily uprooted when the ground is moist. Since it’s quite a labor intensive process, I recommend pulling up quite a lot of chicory at a time—that way you’ll make this endeavor worth your while. The next order of business is to separate the roots from the chicory greens and stalks and clean off the dirt with a hose before taking them into your kitchen. Again, this is a circumstance where already moist soil works to your benefit. 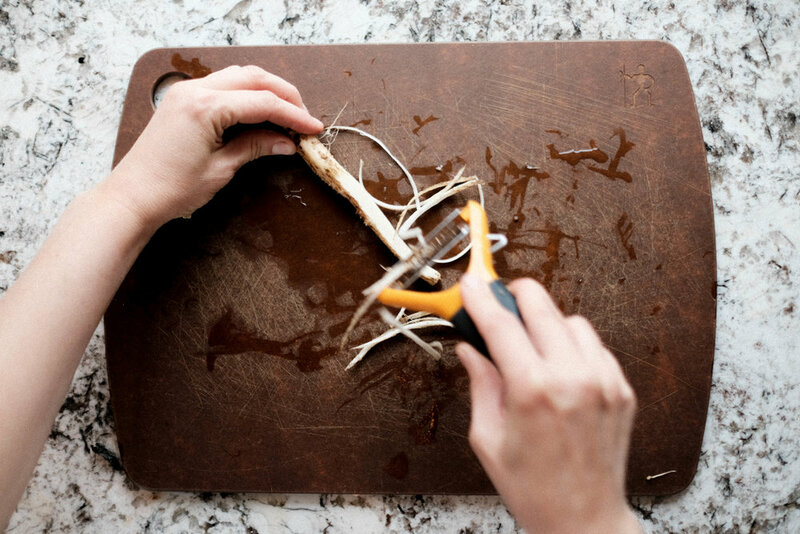 Once in the kitchen, scrub the chicory root with a brush, potato scrubber, or scoring pad to get the remaining dirt off. After all of the dirt has been removed, take a julienne peeler and shred the chicory as best you can. The roots are tough and uneven, but work with it. If you come across bits that are too fibrous or small, chop them up with a knife. The idea is to get the chicory into the smallest, and most even pieces possible before dehydrating and baking. Make whatever tools you have work. Spread the julienne and chopped chicory on a parchment lined baking sheet. Dehydrate the chicory in the oven at 200° F for an hour or an hour and a half. Once fully dry, turn the oven up to 300° F and being roasting until brown and crispy. Pieces of chicory should easily snap in your fingertips. After the chicory has finished roasting and your home smells like— “potatoes, or mushrooms, or coffee, or chocolate—or what is that smell?” says everyone who walks by, then it’s time to grind up the bits. I didn’t want to test out what chicory would do to my burr grinder, so I used a blade chopper. The resulting grind is—as you can see—very inconsistent but it still seemed to work for my brew. 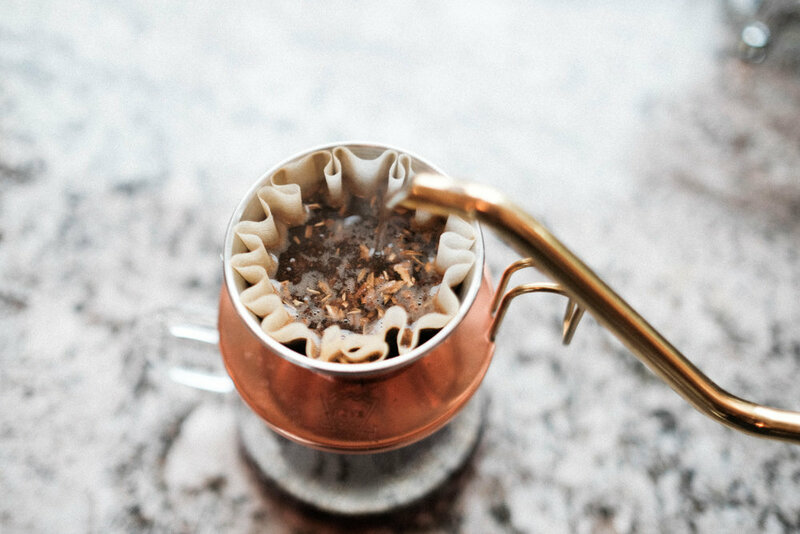 Take a few spoonfuls of roasted chicory powder and place it in the filter of a gravity brewer like a kalita, v60 or Chemex. Add water to the basket just off boil and pour to desired strength. 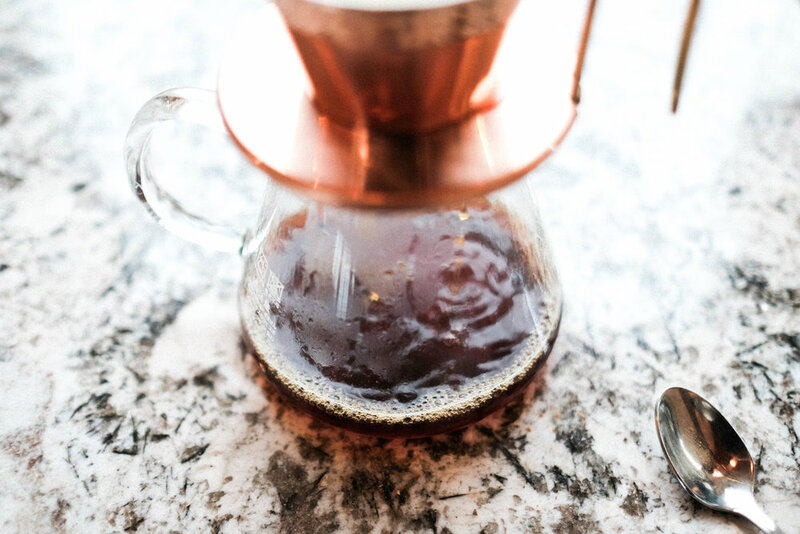 I have found a little bit of chicory goes a long way—I made a whole glass dripper full of chicory drink with only a few scoops of the powder with no compromise on flavor. I was legitimately surprised by how delicious the chicory root brew was. Naturally very sweet, chocolate-y and nutty with a bitter finish. I wouldn’t say chicory tastes like coffee, but with its dark brown appearance and bitter aftertaste I can see why people use chicory as a coffee substitute. It will be interesting to see how the freshly roasted chicory tastes blended and brewed with coffee as well! If you try this out, please let me know how it goes.